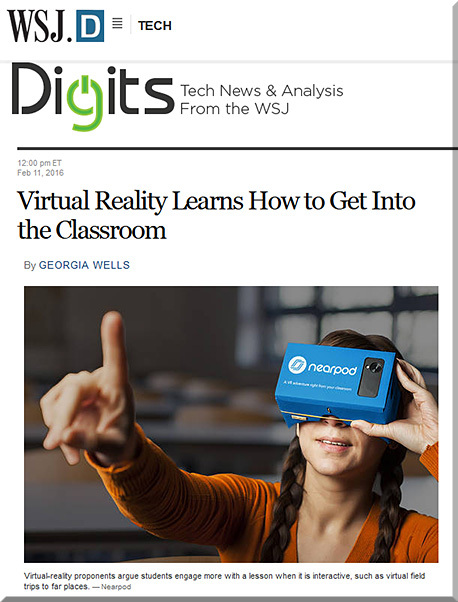 Nearpod Inc., a startup that makes education software used in 10,000 schools across the U.S., is launching virtual-reality lessons on [2/11/16]. Here’s their pitch: instead of requiring schools to invest heavily in headsets and other hardware, Nearpod’s approach relies on students using their own devices or district-supplied electronics. Students already use tablets and netbooks in the classroom, to share text, record and watch videos, and conduct research. Virtual reality – the technology that lets people experience immersive, 360-degree images – would take technology in the classroom to the next level. Google parent Alphabet Inc.experimented with virtual reality in the classroom last September, a temporary project using its cardboard viewer. Virtual-reality proponents argue students engage more with a lesson when it is interactive, such as virtual “field trips” to far places. When today’s kids grow up, they will no doubt mock our penchant for pocket screens. VR and AR could be the new normal. 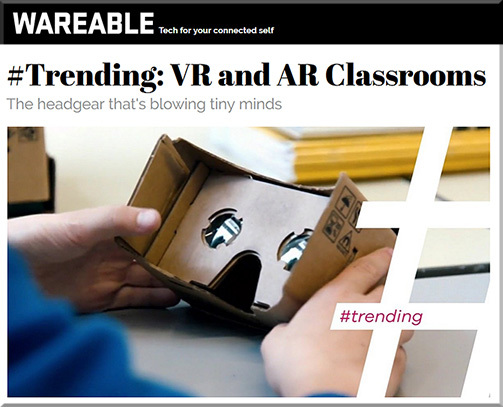 In this week’s Trending we’re looking at the wave of new schemes bringing virtual reality and augmented reality into the classroom as a tool for students. 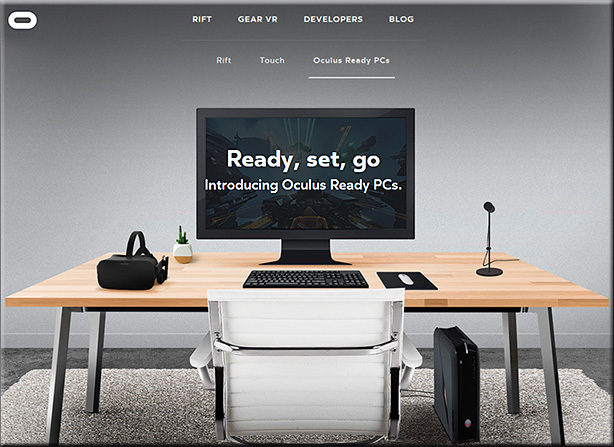 Oculus and Jaunt just started working with universities to offer classes on VR filmmaking. Google has been extremely vocal about bringing VR into the classroom, while Microsofts HoloLens has shown off augmented reality demos for college anatomy classes. The educational benefits of both VR and AR are immense. VR allows students to explore other worlds or relive moments in history through virtual field trips, whereas AR can provide instructions with overlays, maps and more. Here’s the ideas tearing up tech classrooms as well as who needs to go back to the chalkboard. Got a presentation coming up? Between keeping your thoughts straight, sticking to the time limit and braving an audience, public speaking gigs can be daunting. A new Android app for Google Cardboard aims to help you get over your fears by putting you in front of a virtual audience. 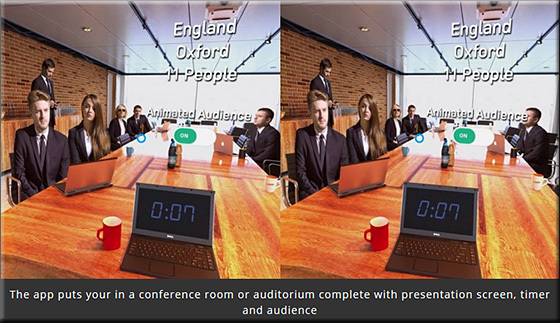 Public Speaking for Cardboard lets you choose between two locations — a small conference room and a large auditorium — with animated audience members and ambient noise to simulate the experience of speaking on stage. Augmented Reality (AR) technologies are making some huge leaps into the educational landscape transforming the way teaching and learning are taking place. Educators and teachers are increasingly adopting AR technologies in their classrooms. As extensions of the physical world, AR technologies amplify its dimensions and bring life to its static constituents. There are a variety of ways you can use AR in your class. For instance, you can use them to take your students into virtual field trips, visit world museums, animate and enrich textbook content and many more. Today we are sharing with you some interesting AR apps specifically curated for science teachers. These apps can make science learning more fun, engaging and challenging. Enjoy! The use of augmented reality (AR) technology in education is on the raise. Some speculate that the year 2016 will be an AR year par excellence. The basic premise behind augmented reality is the extension of the physical world to include components of the virtual world. The potential of augmented reality in teaching and learning is huge. Our AR section here in EdTech and mLearning features a number of key resources to help you better understand how to include AR technologies in your class. We are also adding this handy collection of what we think are some of the best iPad AR apps to use with your students. Check them out below and as always share with us your feedback. Enjoy! Virtual reality is getting a lot better at simulating the real world. Just how good is it going to get, and how fast? And what’s the best way to deploy the technology for consumers and businesses alike? The Wall Street Journal’s Geoffrey A. Fowler spoke to Jeremy Bailenson, co-founder of Strivr Labs and director of the Virtual Human Interaction Lab at Stanford University. Here are edited excerpts of their discussion. As a white male, I would be transformed into a woman of color. I would then experience prejudice firsthand, meaning another avatar would walk in the room and would say horrible things to me about my race and about my gender. For about 12 years now, we’ve been running study after study showing that feeling discrimination firsthand while walking a mile in someone else’s shoes is a better way to change attitudes and behavior.